As South Florida raises groundwater levels to fight salt water intrusion, the threat of flooding from within will only increase, according to FIU research. 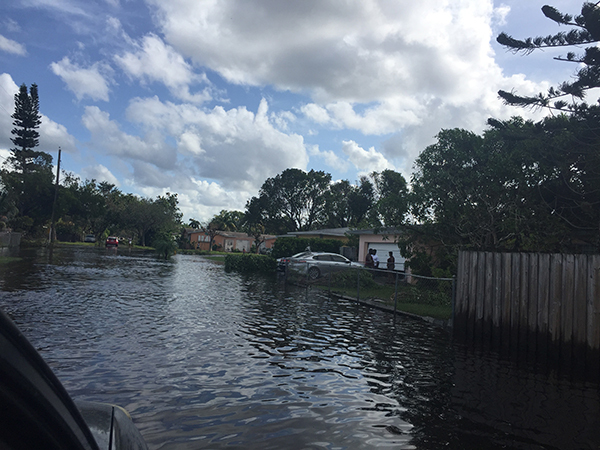 Current groundwater levels in South Florida are a major contributor to inland flood damages, especially during the wet season or extreme rain events. Traditional flood models account for drainage systems, rivers, streams and canals but do not account for the groundwater beneath our feet. FIU hydrologist Michael Sukop has released a model that focuses on South Florida’s groundwater as a cause of flooding. Flooded streets in Arch Creek-North Miami. Photo by Shadaina Dessalines. South Florida protects its drinking water sources from saltwater intrusion by keeping groundwater levels higher than they would be otherwise. As sea levels rise, groundwater levels may need to be raised by elevating canal levels, which could cause more flooding. It’s a trade-off water resource managers need to deal with as they try to control floods, while ensuring water supplies for consumption and maintaining the integrity of the environment. Sukop, along with Jeffrey Czajkowski from the University of Pennsylvania and researchers from nine other universities and government agencies, collaborated on two studies that assessed the flooding risks posed by groundwater, including the economic costs. Sukop examined groundwater levels in parts of northeast Miami-Dade County. Looking at data from the past 40 years, he found groundwater levels are rising at the rate of local sea level. Parts of North Miami and nearby unincorporated areas could see a doubling in the number of damaging floods and a tripling in the number of severe floods by 2060 due to sea level rise, Sukop said. The research published this month in Science of the Total Environment is a collaboration of the Sea Level Solutions Center in FIU’s Institute of Water and Environment and other researchers. It was supported by a grant from the National Science Foundation (NSF). The research team hopes this information will help water resource managers and urban planners better understand flooding and the economic tradeoffs associated with keeping water tables high to control salt water intrusion.